Remember the stupid jokes you loved when you were ten—like “What is black and white and red all over? An embarassed zebra.” Yuck! Yuck! 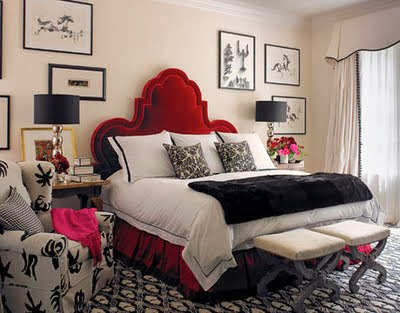 Well, what’s black and white and red all over in my world are the wonderful rooms done in this most sophisticated of colour schemes. I did a beautiful bedroom once for some people who had bought a lovely old John Volk house on the ocean here in Palm Beach. We used a black and white toile de jouy for the walls and the furniture upholstery and red linen velvet curtains at the windows, with the ocean showing in between. It was superb—I wish I had pictures of it, but the owners were terribly photo-shy, and now the house has been sold. So I am going to show you the same colour schemes by some of the great masters—much better than I am anyway. 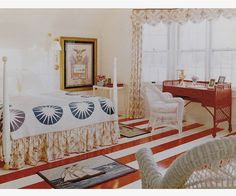 The above is a bedroom by David Easton, absolutely one of the masters of the game. See how skillfully he plays out the colours, never letting the red over-power the room. I think maybe the red does overpower the room a bit in the apartment above, done by Mark Hampton for his wife and himself, but he was still new in the game, and he did get much more subtle. Still, it is an interesting room. This is just an amazing room. 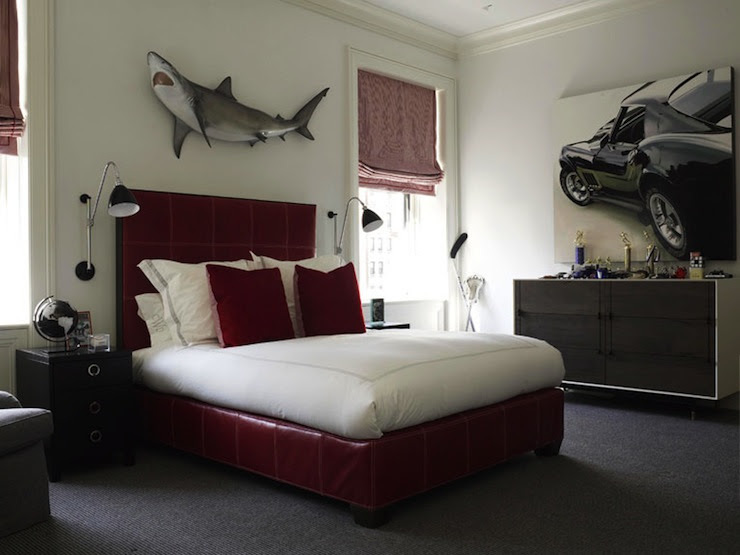 David Kleinberg, another graduate of Parish-Hadley Designs, is in top form here, where he skillfully softens the very powerful black images of the car and the sharp, and the equally powerful, red leather bed by painting the room, walls and woodwork, white. White is such a wonderful background—always, always, always. Don’t be afraid of it. Use it. In the absolute opposite vein, by another of the old Parish-Hadley firm, is this charming little bedroom by Libby Cameron. Absolutely the antithesis of the David Kleinberg room, she follows in Mrs. Parish’s footsteps with the little white iron bed, the quilt, etc., etc., etc. Because I live in a hot climate, I am drawn to rooms with lots of white (as I said above), and here the white is used wonderfully by Charlotte Dunagen to offset what might have been too powerful a use of black and red here in the tropics. Instead, the combination is cool and inviting. 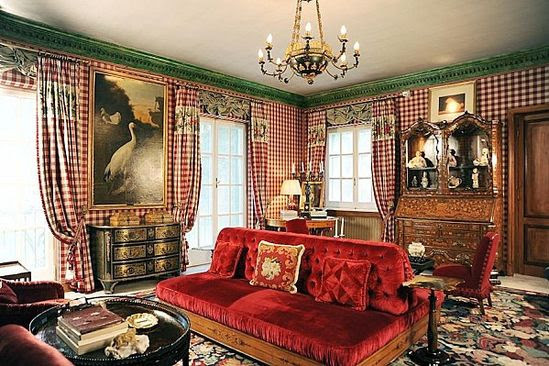 I am ending today with one of my favourite rooms, a beautiful salon in Valentino’s villa, done by one of my favourite decorators, Renzo Mongiardino. Although most of us won’t ever have a room like this, it is always worth studying the greats, and Mongiardino is definitely one of the greats. The absolute perfection of balance; the juxtaposition of that one line of green “marbre” at the top of the room; the use of checks (always my favourite!) mixed with tapestry and great paintings……Wow! That’s all I can say. Just, Wow!